I am not much of a hunter, but I used to practice archery. I learned several lessons from shooting arrows at a target, some of which apply directly to my genealogical research efforts. The first lesson concerned lost arrows. I would practice in the backyard of our home and even though we had the customary Southwestern wall around the yard, I would frequently shoot arrows off into the vacant lot next door. I soon learned that the arrow did not always follow an exactly straight path and frequently went a lot further than I anticipated. So, in searching for my lost arrows, I usually had to look in different directions and look a lot further than expected. The same thing applies to genealogical research. Records may not be in the expected location and you may have to search a lot further than originally anticipated. Records can move around. County boundaries may change. Records may end up in private or institutional repositories. County records may be collected in the state archives. All sorts of things can happen to put records into unexpected locations. One thing about searching for arrows. I always knew that the arrow existed. Unfortunately, searching for records is not as reassuring. There is always the possibility that the record was destroyed or worse, never made. But the idea that finding the record, like the arrow, might not be where expected and take a lot more searching than anticipated is applicable. I also learned that you didn't have to hit the center of the target every time to score. In fact, I never go good enough to hit the center very often. But you got points for every hit inside of the rings, usually 1 point for the outer ring, up to 10 points for a bullseye. In essence, the same is true for genealogy. You may not hit the exact record you are looking for every time, but no work is wasted because you get to count near misses. In fact, if you get enough near misses, you just might prove your ancestor without ever hitting the exact record that you are looking for. 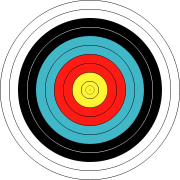 To carry the target analogy a little further, I would suggest that hits outside the bullseye not only add up points, but may be enough to prove relationship. As the rings get further from the bullseye, they are analogous to records that are less probative of the facts, but still valuable for establishing the history. Also, if you keep shooting, you are bound to hit the center of the target someday. In one of my last posts, I explored the reasons why I believe that "scraping" in the form I found it, may not be a violation of the copyright law. There are still other considerations that apply to this "scraping" type activity. The key issue with this type of website is content. But first, a review and an analysis to try and differentiate scraping from other types of legitimate activities. The initial difficulty here is differentiating between "scraping," as an activity, and news aggregators or readers. Essentially, what a reader does and what a scraper does are identical. The main, and most important, difference is that a reader or aggregator bases its activity on the voluntary and intentional activity of a user who benefits from the aggregation. Commonly, a reader or aggregator will use an RSS feed that has to be initiated by a specific user of the reader or aggregator program. In contrast, the scraper website collects content from sites determined by the programmer of the website, not for the programmer's personal use, but for the purpose of attracting "hits" to promote advertising on the scraping website and thereby benefit the programmer. At first glance, you may think that the key difference between the two types of activities is obtaining permission from the target websites; those aggregated by the reader user and those scraped by the website scraper. This is not the case. I can use any number of aggregator programs to "watch" the content of specific websites for changes in content both with or without the permission or knowledge of the target website. So we must look elsewhere to determine the reason why we would accept the actions of a reader or news aggregator and decry the actions of a website scraper. I think the key difference is the venue where the scraped or aggregated content is used or displayed. If I subscribe to a website through a reader or aggregator, the resulting content is displayed for my personal use in my own program. As I noted already, a website scraper has an entirely different motivation. The content is displayed openly on the Web and is used to attract "hits" to the scraping website with the expectation that the hits will generate income. But then this point raises another issue. Aren't any of the websites that are monetized doing exactly the same thing? Don't those of us who have advertising on on blogs or websites hope that the clicks on the ads will generate some form of income? If I go on Google+ or Facebook and give people a link to a website, I suggest, as is done in many technology groups on the Web, aren't I doing the same thing as a scraping website? It would be nice to believe that the contributors with links to suggested websites were motivated by altruistic desires to better mankind, but their participation is more likely monetarily based. They would like to attract more traffic to their own websites and thereby promote their own economic well-being. But again, on one side we see this activity as "valid" when done in a certain context and other activities as invalid. So what is it about a website scraper that is objectionable? If a monetary motive is commonly assumed for most web content and the scrapers aren't doing anything too much different from other legitimate activities, why do we think scraping is bad and the other activities are "good" or "acceptable?" I need to get back to the idea of permission. Do I need your permission to provide a link to your website? Obviously not. Do I need your permission to summarize or quote some of your content? Again, obviously not. But the second question depends on the extent of my quote or copy. This gets back into the issue of fair use in copyright law, which I will leave alone for now. Is then the issue with scraping websites only dependent on the fact that the scraping is done without permission or even knowledge of the target site? It doesn't appear to me that permission is an issue. For example, if my site is included in an article talking about the forty best blogging sites, am I going to be upset? Not likely. So why is there outrage about scraping? If the scraping website uses more than a link to the target sites, there may well be copyright issues. If the scraping website includes a substantial portion of the content of the target sites, again, there may be copyright issues. But the real issue here is something a lot less obvious. Scraping websites are more like spam and graffiti than they are like legitimate websites containing content. At the core, they are destructive rather than constructive. They take up time and space on the Internet without adding anything of value in return. It is the lack of content that is the issue. You can't claim freedom of speech when there is no speech. In other words they are worse than the people who drop flyers and business cards in my front yard, because they are using my content to promote their own purposes without either adding value or providing meaningful service. They are essentially spam. In addition to wasting people's time with an unwanted website, spam and scrapers both eat up a lot of network bandwidth. In that way, scraping falls into the category of being destructive rather than constructive. I don't want to appear to be a conspiracy theorist, but I do attribute a significant portion of the problems I face in the genealogy world to that acronymic program; GEDCOM. I have been dealing with the vagaries and limitations of the program, officially known as GEnealogical Data COMmunication, almost since its inception in 1984. What it boils down to, is that GEDCOM has been the only commonly accepted way to share genealogical data between the various insular database programs. But I am starting to believe that the program was specifically written to make my life even more difficult than it is already. In its conception, the idea is laudable. Create an easy to use program that allows differently designed genealogical database programs to share data. But from the very beginning, few if any of the various commercial implementations of GEDCOM used its entire potential. The developers of each of the commercial programs felt compelled to add their own unique features. Features that were not adequately ingested by a GEDCOM export were lost entirely when imported into a competing developer's program. This misfit of the data resulted in a steady loss of information. Of course, my program on my computer kept its integrity. But every time my records were shared, a little bit (or more) of the information in my file was lost. Not lost in the absolute sense, but certain pieces of information in my originating program were lost in transferring the data to another program. This alone was a fact that I could have lived with, but the real problems only showed up in GEDCOM's old age. New features, unheard of and unplanned for, kept cropping up in new programs. Those new programs kept getting more and more integrated with online resources and finally, some of the programs broke entirely away from a single program on a my computer sort of scenario, and instead began to utilize online databases and incorporate those databases into my local program. If the problems caused by this integration had stopped there, I might have maintained my neutrality towards GEDCOM, but now there is an entirely different problem: GEDCOM uploads onto online family trees. The users of online family tree programs and the developers of those same programs are unanimous in their support of using GEDCOM to upload a file to the Web. But due to the fact that it was so easy to export your data to a GEDCOM file and then almost immediately turn around and share another copy to be uploaded, caused a huge surge in the number of online duplicate family trees. The argument that it is wasteful to require someone to re-enter their entire database, merely to share that research online is laudable. But that is not exactly what is happening. 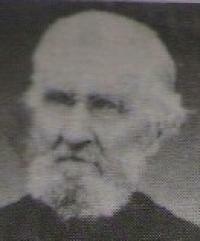 The vast majority of online family trees are merely copies of previously uploaded family trees. My experience is that this proliferation of family tree online makes finding those that contain original research difficult or nearly impossible. Rather than sharing the benefit of additional research, the extensive field of copies severely reduced the chance that I could find anything of value in the family tree programs. 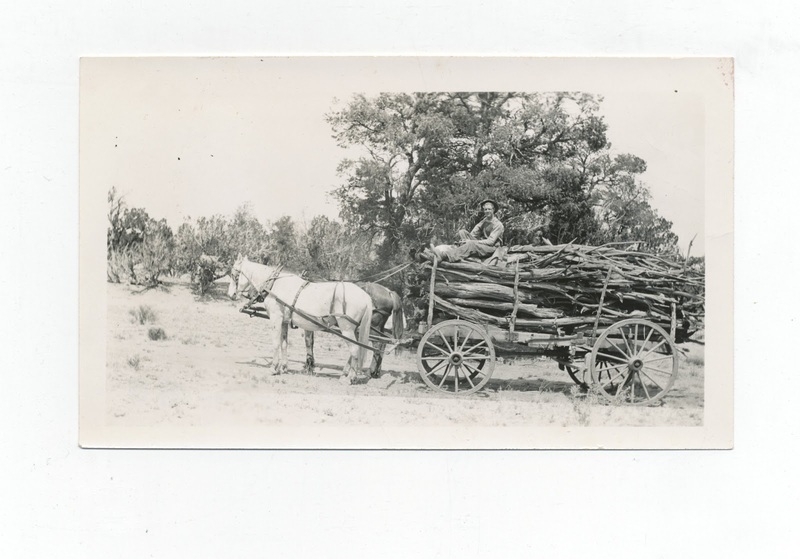 I have frequently heard the argument (and repeated it in this blog) that the benefit of online family trees is chiefly in giving a serious researcher leads that they may otherwise have missed. In todays world, with some of us literally buried in online family trees that are primarily copies, that advantage, if there ever was one, has vanished into a huge pile of duplicates. There is literally no way that I can deal with all of the variations and duplicates online. Today, for example, I spent considerable time trying to untangle a number of duplicate online entries for a patron at the Mesa FamilySearch Library. My attempts were largely unsuccessful because the scope of the duplicate entries defied resolution. The original "ease of sharing" mantra of GEDCOM supporters has turned into a sorcerer's apprentice nightmare of duplicate files. How many people believe they are "doing their genealogy" when all they have done is to copy a copy of a copy into an online family tree program. This is demonstrated by the very, very small number of online family trees that are at all supported by source citations, even when those citations are simple to obtain and include. You might argue that it is too easy to blame GEDCOM for the problem. The real problem is much more complex. That may be true, but will rewriting GEDCOM or producing a substitute reverse the trend to create more and more copies of the same data? Maybe we should focus some serious attention on the issue of duplicates and the difficulty of stopping rampant copies, rather than facilitate more copies by developing even easier to use copying programs? Do blog scraping sites violate the blog owner's copyright? I noticed that my blog has been posted on one of these website scraping sites. This is the kind of site that has no original content, but just repeats or scrapes content others have written and does it to get some small amount of ad income from ads on the scraping site. In essence the scraping site is taking advantage of the content of the originating site in order to make a few dollars from people who go to the site looking for something else. Some of these websites prey on misspelling. If you accidentally misspell the name of an original site, you just may end up with one of these patently commercial scraping sites. My question, as set out in the title to this post, is whether or not scraping is a violation of copyright. It turns out that the answer is likely very complicated. You have to look at the definition of a scraping site very carefully. Let me give you some hypotheticals to show what I mean. Let's suppose that I write a blog and put a link in my blog post to your blog. Does that link violate your copyright? I can't imagine that anyone would think that there was problem with linking to another website on the Web. In this case, there is no content from the originating site, just a link. But let's carry the hypothetical a little further. What if I put a link to your site and quote some of your content? Does this violate copyright law? If you are acquainted with any of the terminology of copyright law; think fair use. The issue here is whether or not the "quoted" material is a substantial reproduction of the entire original content? I would have the opinion that duplicating an entire blog post either with or without attribution would be a violation of the originator's copyright. So is the scraping website protected by the "fair use" doctrine? Does the fact that the motivation for listing the original websites is to make money have anything to do with how you would decide if there was or was not a violation of the originator's copyright? By the way, the copyright does not make a distinction between a commercial and non-commercial use of the original constituting or not constituting a violation of copyright. The fact that the reproducing (scraping) party does not make money from the reproduction is not a factor in the issue of violation, although it may ultimately be an issue as to the amount of damages assessed. Does the fact that the actions of the scraper annoy me, make any difference? I would answer, not in the least. Whether or not you are annoyed by the violation of the copyright makes no difference as to whether or not there is a violation. Likewise, you have no independent claims for your wounded feelings because of the copied content. Copyright is a statutory action (i.e. based on statutory law) and unless the cause of action is recognized by the law, there is no cause of action. Now, in an outrageous case, you may have some kind of tort (personal injury) claim, but that is way outside of my hypothetical situation. So what is the answer? Does scraping violate the originator's copyright? If only a small portion of the blog is copied (scraped) then I would have to have the opinion that it is not. Essentially, no matter what the motivation of the scrapper, there is not enough content copied to violate the fair use doctrine. Now, that is my opinion. Your's might differ. That is what makes lawsuits. Do I think there are other reasons why scraping websites are objectionable? Certainly, but those reasons have nothing to do with copyright and they are probably the subject of another different blog post. So, if you are reading this from scraping website, bear in mind that there may be a serious problem with that type of website. You would think that genealogy would be about the least controversial topic in the universe. But, as usual, where there are people with opinions, there is controversy. In my advanced age, I get the opportunity to review comments from my blog readers that show that myths, rumors and lies as the basis for controversy are alive and well. I am afraid that I cannot publish some of the comments because they contain unacceptable language and, as a side note, I usually find the worst examples also lack any spelling or grammar abilities. The subject that seems to get most, off-the-wall, comments is that of who owns the genealogy companies. There seems to be a strong sub-group of genealogists who are convinced that even genealogy is subject to conspiracy and oppression of people's rights. I hesitate to repeat any of the assertions made by these commentators, lest they see the words in print and view my repeating their remarks as an affirmation of validity. Oh, by the way, most of this type of comment are, of course, anonymous. I would simply shrug off most of these people were it not for the fact that I have to deal with some of them in person. Yesterday, for example, I spent over an hour on the phone trying to help someone with a problem that arose when someone else was told that "FamilySearch Family Tree was not supposed to be used right now and that everyone should be using New.FamilySearch.org." There is a constant undertone of people who tell me that they were told that Family Tree is still not ready to use and so they are not moving over from New.FamilySearch.org yet. This is one of the milder myths that are floating around. The main one, I hear constantly, is that some entity, usually either the LDS Church or Ancestry.com, own all the genealogy in the world and are thereby profiting from their monopoly and keeping various researchers from finding their family lines. A variation on this idea is that the LDS Church owns Ancestry.com and thereby is controlling all the genealogy in the world. Oh, you hadn't heard that? Well, one reason I have been writing my series of "Who Owns the Genealogy Companies" over the years is because of people with this idea. So there is no misunderstanding; the LDS Church does not own Ancestry.com and never has. The most current rumor/lie that I got yesterday, involved an assertion that Ancestry.com owned the Social Security Death Index and was manipulating the data for its own purposes, mostly to make money from people using the SSDI. This would be funny, if the people weren't serious. In past years, I have spent considerable effort trying to convince friends and relatives that their cherished ideas were nothing more than myths and rumors. For example, at one point in response to a plea from a relative about religious broadcasting being banned, I went to the Federal Communications Bureau directly to obtain information about Madeline Murray O'Hair. There is a whole Wikipedia article on this subject. I talked to a very nice person at the FCC who informed me that they had a whole department dedicated to trying to stop that and other rumors. What is interesting to me is that these types of stories circulate in families and get preserved in surname books as the gospel truth. 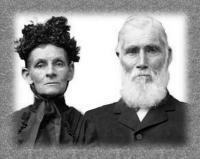 One of the most common genealogy myths involves the "Three Brothers" story. 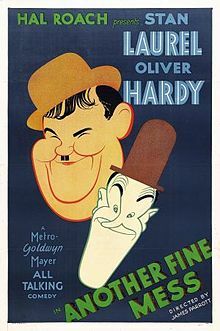 You might be interested to know that this story is so old, it was collected by Jacob and Willhelm Grimm and included in their collection of folklore. I have a surname book, from the Morgan side of my family, that specifically repeats this myth as fact. In that story and its variations, there are three brothers that come to America, one goes south, one stays in New England and one goes west. Now, it is entirely possible that this is true, but the story itself is so engrained in myth that in my case, it is most certainly false. Many of the repeated and hallowed stories of our ancestors, passed down through the generations, may prove to have some basis in fact, but in some cases they are absolute fables. 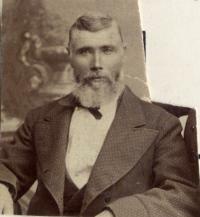 I have mentioned before that one of my Great-grandfathers was said to have been "adopted." Because of a lack of data, we will probably never unravel this myth. It is more likely that he was the son of one of the daughters out-of-wedlock and "adopted" by her parents. Sometimes we would prefer the myth to the reality. There are several extensive stories passed down in my family and I have purposefully refused to investigate the facts, because as has been said to me, I didn't want to go there. But, you say, what if the story is true? Well, that gives us all something to do in our spare time. We can hunt down the details of family stories. Sometimes the truth is more impressive than the myth but sometimes the myth takes over despite the truth. 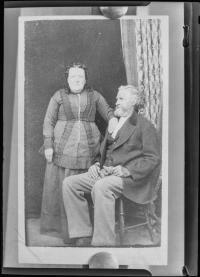 This is the second in the series Introducing the FamilySearch Research Wiki. In this segment, I talk about the structure of the Wiki pages as shown in the View menu located in the right side Navbox on the Research Wiki. Understanding the structure of the pages is central to understanding both how the Wiki operates and how to edit and contribute information to the Wiki. You can find Part One here. It is interesting that so many people in the United States trace their ancestry back to the 102 passengers on the Mayflower when so few of the Mayflower passengers have any proven ancestry at all. In addition, the statement has been made that "if all the people who have been claimed to have come on the Mayflower to New England in 1620 actually had come on that boat, it would have sunk mid-Atlantic." See Alicia Crane Williams, in American Ancestors, Part II: Who Came on the Mayflower: Separating the Facts from the Myths. These two facts are important indicators of the state of affairs of early American genealogy. Of these 102 early settlers to America, the General Society of Mayflower Descendants recognizes only 26 heads of families who have proved descendants. See General Society of Mayflower Descendants. This is the case because about half of the passengers died during the first winter in New England. Interestingly, the crew of the Mayflower are mostly unidentified and no family information is known about them. So how many of our "documented" pedigrees go back to a book or record that was, in the words of the American Ancestors article, "mistaken, imaginary, or outright fraudulent." I have found that this is one of the major challenges of pursuing a documented pedigree back into the 18th and 17th Centuries. 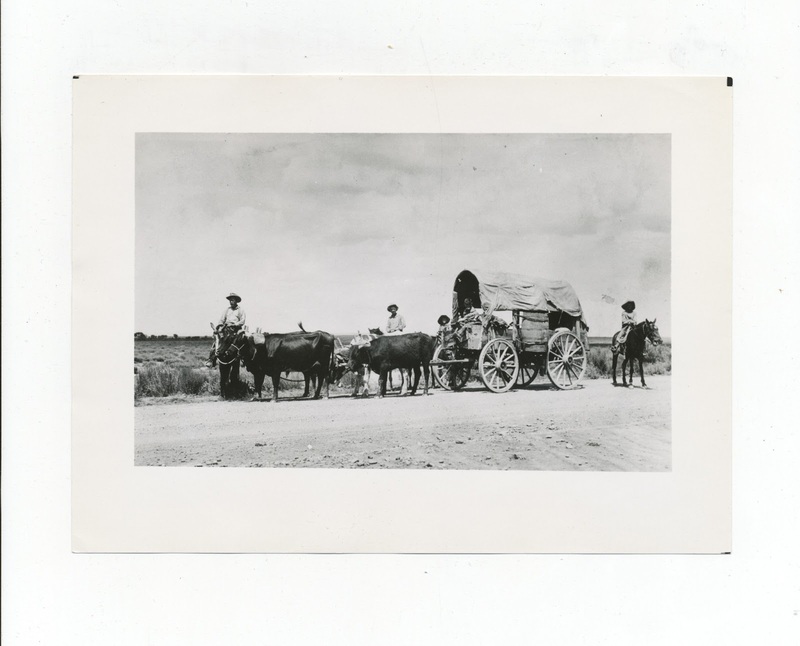 Systematically careful documentation of the early settlers in America began in the 1800s, almost two hundred years after the first settlers arrived. The earliest of these books is acknowledged to be Farmer's Register. See Farmer, John. 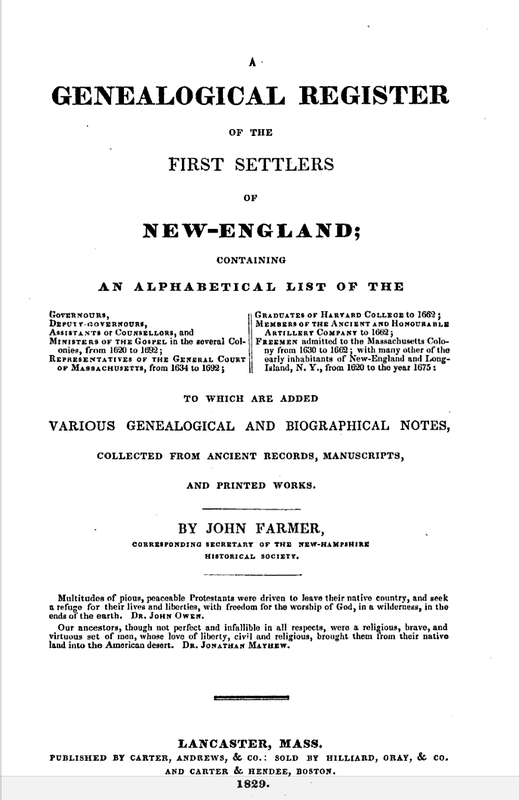 A Genealogical Register of the First Settlers of New England ... To Which Are Added Various Genealogical and Biographical Notes, Collected from Ancient Records, Manuscripts, and Printed Works. Lancaster, Mass: Carter, Andrews & Co, 1829. That book was followed by a more extensive work, usually referred to as the Genealogical Dictionary first published in 1860. See Savage, James, O. P. Dexter, and John Farmer. 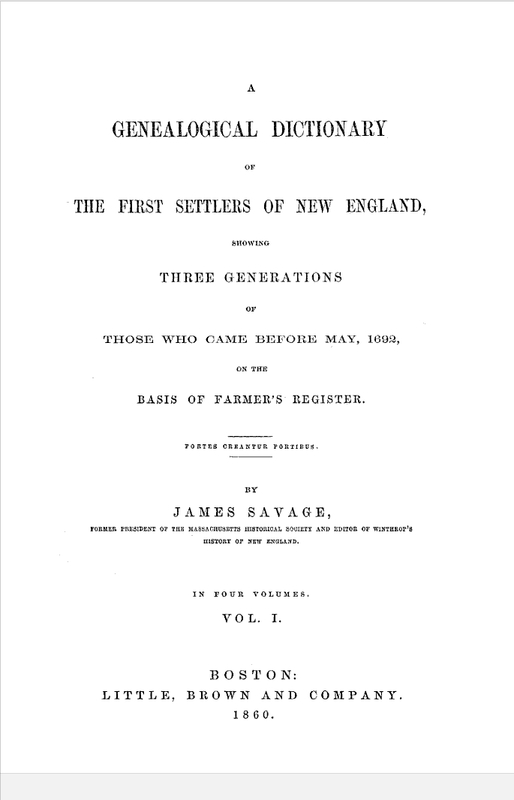 A Genealogical Dictionary of the First Settlers of New England, Showing Three Generations of Those Who Came Before May, 1692, on the Basis of the Farmer's Register. Baltimore: Genealogical Publishing Co, 1965. Unfortunately, neither book cites any specific sources for the information. However, both books are considered fairly accurate. I find it interesting that the Genealogical Dictionary is supposed to include those who came before 1692 and my own ancestor, William Tanner, who arrived in about 1680 is omitted as are many other settlers in Rhode Island. How do we avoid the trap of relying on undocumented and unreliable information in compiling a genealogy? That is a basic question that has to be answered by nearly every researcher at some time in their work on compiling a family history. Even some of the most venerable and repeated stories passed down from our ancestors contain misstatements and outright fabrications. On the other hand, how do we overcome the tendency to become hopeless skeptics afraid to rely on even the strongest evidence? Somehow we need to navigate between those extremes. I have yet to examine a pedigree that goes back into the early 1800s, that did not have some serious issues with consistency or believability. Most of the present-day surname books avoid this issue by summarizing the background of the first named ancestor and then focusing on his or her descendants often without any documentation at all. But what if you do not have ancestors in New England? Or even the United States? Well, then you have the opportunity to set the stage for all those who come after you. You can provide the sources and documentation so that future generations won't have to wade through fables and frauds. Those of us with lines that go back into these early American settlers can use as broad a spectrum of sources as is possible to finally document our ancestors and perhaps, at some time in the future, begin to turn the tide of copies of unsupported genealogies. This is another in the series of Quick Views of Genealogy. This segment is an introduction to the FamilySearch.org Research Wiki. It tells how to find the Wiki and explains some of the basic concepts and features. In subsequent Quick Views, I intend to follow up with more in depth discussion of the functions of the Wiki and give instruction on how to edit articles. As usual I appreciate comments and suggested topics. 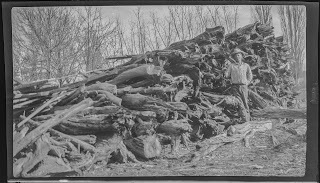 There is an explosion of online digitized records going online almost daily. Most of this news has passed into the background of the genealogy world because adding new records has become so common. The basic question raised by adding all of this new content is whether or not the new records can be adequately searched. Right now, the biggest problem is that adding the records does not make them automatically available to researchers. For example, any digitized image that contains genealogical information must be viewed by the researcher to access the information unless the document has been indexed. Even if and when the document is indexed, the researchers are then at the mercy of the indexers as to whether or not the the information was properly extracted and of course, at the mercy of those who created the document in the first place that the people and events were properly recorded. FamilySearch.org has added millions of new records in the past week and about half are indexed. When the records are added without an index, it makes it necessary to browse the images to find relavant information. This is not bad, in fact it is very good. At least the images are available for free online obviating the need to order microfilm copies from the Family History Library. 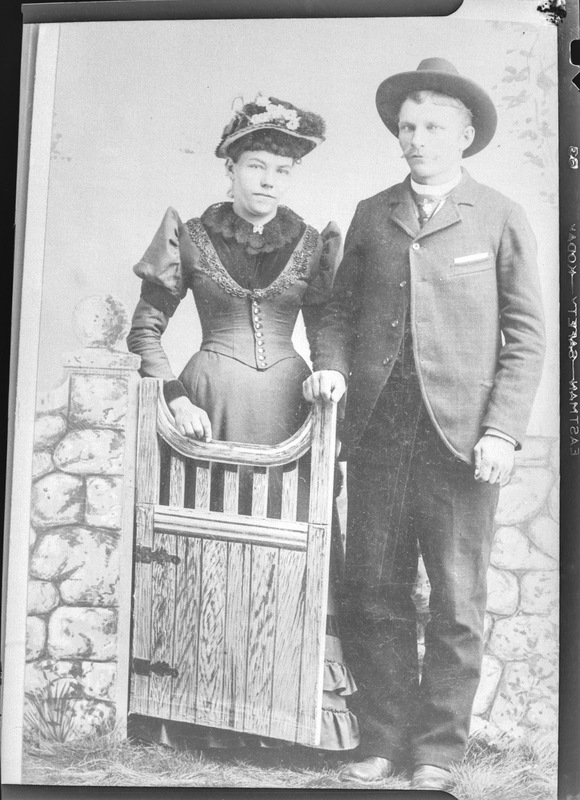 See the latest announcement at "FamilySearch Adds More than 1.1 Million Records and Images to Illinois County Marriages Collection." But this does point up the need to keep working on the FamilySearch Indexing project. If you would like to see a summary of many of the newly added records in other collections, you can go to GenVines.com for an update. The larger online website collections of digitized documents keep growing. For example, back in April I reported that Trove.nla.gov.au, the website of the Australian National Library had just over 338 million online resources. Today, that number has grown to over 344 million. In the last month, the UK based, findmypast.com added 23 million records and 121 million newspaper pages from around the world. This vast increase on online genealogical resources gives the impression that soon almost all the records will be available online. However, the smaller, local collections of records, some of which are the most valuable to genealogical researchers, are very unlikely to be in the cue for digitization. There will still remain the challenge of locating and viewing localized collections of record. My prior posts were not intended to answer the question as to whether family history was actually part of the greater study of genealogy or whether the opposite was true and the greater study is family history. I think they are essentially the same thing depending on your own personal twist on the definition of each. Both terms are emotionally laden and are likely culturally and contextually defined. What I have been writing about is the apparent attempt to put the two terms into an artificial opposition to each other; implying that if you are doing "family history" you can somehow ignore genealogy and vice versa. Attempts to define "family history" without using a reference to activities commonly attributed to genealogy become highly contrived. Similarly, any definition of genealogy that excludes the idea of examining history and particularly "family history" is likewise contrived. If the term "genealogy" has negative connotations, then let's rehabilitate the term, not abandone the activity by artificially distinguishing between "genealogy" and "family history." 1. I am not against expanding the reach, the tent, the coverage, the activity or whatever of genealogy or family history to anyone with any skill level. I am in no way exclusive. I am willing to teach, talk to, educate, assist, help or otherwise hold the hand of anyone whether or not they have ever heard of either genealogy or family history or not. In fact, I have spent the majority of my time trying to get everyone, at every age level, involved in and interested in genealogy and family history. I have taught many classes on compiling journals, taking oral histories and preserving a photographic heritage. 2. I am not down on any age group or experience level whatsoever. I helped raise seven children. I have 31 grandchildren at all age levels. I teach old people, young people, the youth, and children. Any references I make to skill levels, interest or other competency is based on my own experience over the years teaching at both a high school and community college level. My observations on the limitations of today's youth are directed at the poor state of most of the school/educational systems, not at their individual intelligence or ability. 3. I am not anti anything. I am for a lot of things. One of the main things I am for is education at all levels. I am especially interested in educating people about genealogy or family history or whatever term makes you comfortable. Now, what am I saying? I am saying that you can't and shouldn't throw the baby out with the bath water. 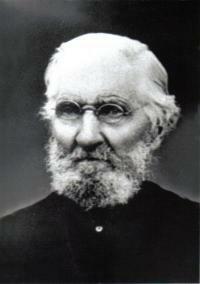 This means, in this context, that those who wish to promote or sell their concept of "family history" should not make it difficult for the people who think they are doing "genealogy" and those who are promoting "genealogy" should not look down their long noses at those who are trying to do "family history." We are both, all of us, together, jointly etc. trying to accomplish the same thing. Maybe we use different terms, maybe we use different methods, but ultimately we want to accomplish the same thing: preserving, explaining, elucidating, expanding upon, discovering, researching, documenting etc. our family history or genealogy. My comments, for the most part, are not directed to those diligent, educated, persistent researchers of all ages and abilities. They are directed primarily to those who have little or no interest or understanding of either genealogy or family history and think they can accomplish either by denigrating one or the other. When I finished my years at the University of Utah for both of my degrees, it turned out that I had more hours of classes on military history than any other subject. I spent the next couple of years on active duty in the Army during the Vietnam War, but ended up serving in Panama rather than going to Vietnam. I bring this up to make a point about genealogy. Genealogy is history, no matter what the attitude of the academic world or anyone else for that matter and if you are doing genealogical research, you ignore history at your peril. I naturally think of the wars because this is my background. But many researchers have ignored military records, even when those records are indicated by the time and place where their ancestors lived. 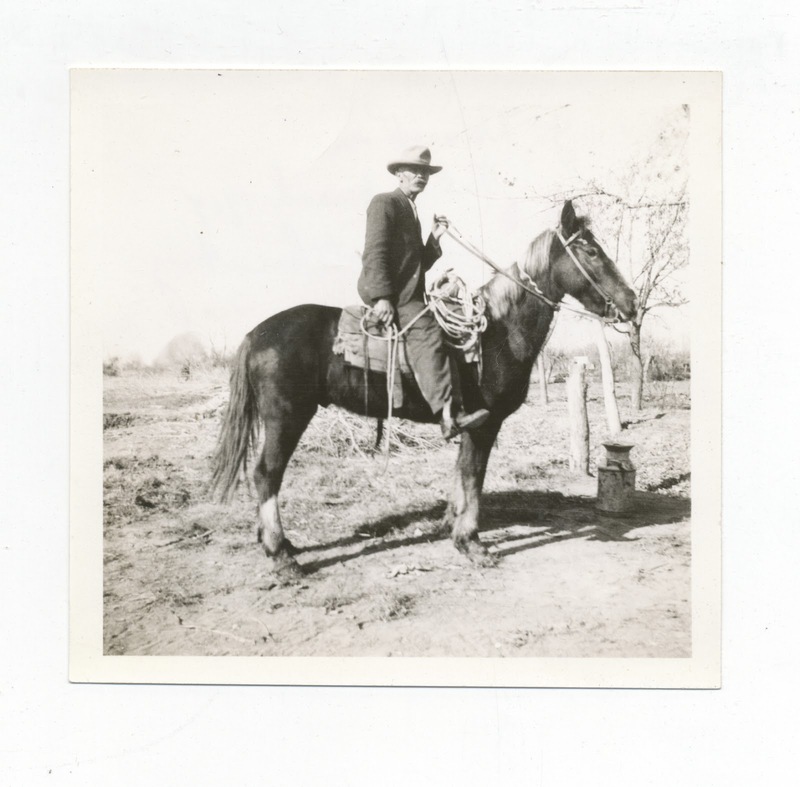 I first became involved in the military history aspect of genealogy when I tried to determine when and how my Grandfather served in World War I and on the Mexican Border. Even though I had direct knowledge that he served, it took me a considerable amount of research to find the units he served with, but that is another story. Surprisingly, statistics and some details about wars in America are hard to come by. Many of the casualty figures, including dead and wounded, are estimates rather than accurate numbers. This is particularly true for older conflicts. There is also a problem with the definition of a "war." For example, when my Grandfather LeRoy Parkinson Tanner served on the border with Mexico in about 1916, that military action was not considered a "war" as such and is not usually listed as a war in compilations of casualties. Wars are important to genealogists because they generate records. Military records can be both surprising in the amount of genealogical data they contain or very disappointing in the lack of information. Records about the involvement of the individual soldiers can be scattered into a variety of record sources. Someone commented recently to me that I seemed to have a rather dim view of the average person's knowledge of history. I can say that my experience in this regard simply forces me to that attitude. Among genealogists, the number of people who are aware of our history, is likely quite a bit greater than the general population, but there is still a lack of awareness of all of the military conflicts in America, both before and after Independence from England, that could have generated records. The earliest American war is generally believed to be King Phillip's War from 1675 to 1676. However, there is also the Pequot War of 1637. Since that time, I count more than 30 different conflicts that could be considered to be wars, both declared and undeclared. For example, as I write this post, is there a U.S. war going on? Answer that question and you can see why the number of wars may vary. But the fact of the matter is that millions of Americans have fought in various conflicts from early colonial times to the present and their records have piled up in various repositories around the United States and abroad for hundreds of years. With regard to King Phillip's War, I find about 5,000 books listed in WorldCat.org on that subject alone. You might want to start with the FamilySearch.org Research Wiki article, Massachusetts Military Records. You might also check out the article Colonial Wars, 1607 to 1763. There are hundreds, if not thousands, of websites dedicated to military history. The rule here is that if your ancestors lived in America when one of these wars was in progress, there is a possibility that someone in your ancestral family was involved in the war and you may find records about your family that you previously were not aware of. If you think about it you may wish to go to the Research Wiki article, United States Military Records, to get started. Of course, military records also exist in almost every other country of the world. No matter where you live, you just might try researching the military records for your own country. Imagine my surprise, as I was scanning photographs from the Overson Photographic collection, to find this photo of General John J. "Black Jack" Pershing. I recognized him immediately and began researching the incident that led to the photo. Back on January 31, 1920, General Pershing came to the University of Arizona Campus to dedicate the Memorial Fountain in front of the Old Main Building. The Fountain was built to commemorate all of the University of Arizona graduates who had lost their lives in World War I. It was extremely interesting to discover this historic photograph during the Memorial Day Weekend. 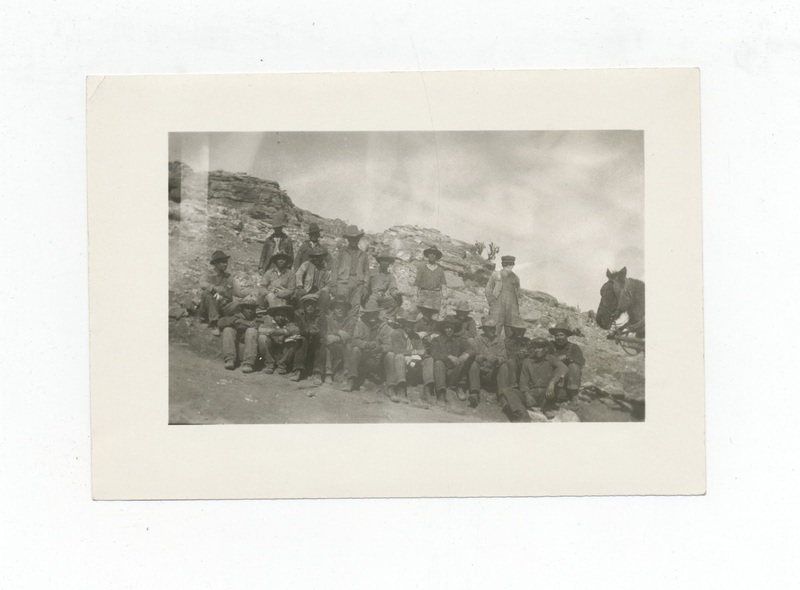 It is evident that most of the photos in the Overson collection were taken by Margaret Godfrey Jarvis Overson or her father, Charles Godfrey DeFriez Jarvis from the late 1800s until about 1950. Although there is no way to identify who took this photo, I am guessing that it was likely taken by Margaret Overson's daughter, Eva Margaret Overson Tanner, my paternal grandmother. The reason I believe this is because, my grandfather, her husband, LeRoy Parkinson Tanner was a veteren of the Border War with Mexico of 1910 - 1919. General Pershing was in charge of the campaign and led the Pancho Villa Expedition in 1916. I have a few photographs showing my grandfather in his uniform, but very little information about his involvement in the campaign. The border campaign is known for the fact that George S. Patton, later General Patton, led the first assault with armored vehicles at a ranch near San Miguelito, Mexico. I am assuming that as a veteren, my grandfather made the trip down from northern Arizona to attend the service with his former commander. 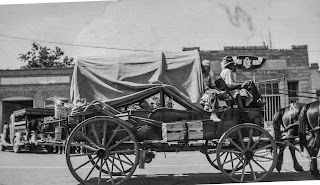 If Eva's mother, my Grandmother Overson, came with them on the trip, she may also have taken the photo. Situated at the west entrance of Old Main, the Memorial Fountain, honoring those UA students who lost their lives in World War I, was the gift of Alexander Berger, an uncle of Alexander Tindolph Berger, one of those to whose memory it is dedicated. On January 31, 1920, the Memorial Fountain in front of Old Main was dedicated amid a huge turnout of students, faculty, townspeople, and military who had come to honor the University's World War I dead and to greet the guest of honor, General John J. Pershing. General Pershing's speech was brief and impressive, following which the honorary degree of Doctor of Laws was conferred upon him by President von KleinSmid. See Wikipedia: Border War (1910-19) and The University of Arizona, History and Traditions, Berger Memorial Fountain. It will be really interesting to see what else turns up in this seemingly endless collection of now over 5,700 images. Is genealogy now politically incorrect? I am old enough to remember when my legal secretary became my legal assistant. I can also remember clearly when waiters and waitresses became "servers." Now, it seems that the venerable old term "genealogy" is undergoing the same politically correct make-over in favor of "family history." When my secretary became a legal assistant, nothing about her job changed, not even her salary. I have no idea if she was happier or felt more important when she went to her job everyday thinking she was now a "legal assistant" and not a mere secretary. This shift in terms is more than just a fashion or trend, it goes much deeper than that. We may joke about how garbage collectors became sanitary engineers, but this whole process is part of larger changes in our society, some of which are neither good nor desirable. One of the more visible socially and politically charged associations with some of these changes has to do with gender roles and perception. The change from waiter and waitress to server is a prime example. But the term "secretary" did not historically infer that the person was either male or female. There is a perception here that changing the label will somehow change the job. I read a statement recently that clearly stated that family history was important because we learned the stories of our ancestors and not "just genealogy" finding names and dates. I have been doing genealogy for a really long time and that is exactly what I thought I was doing: learning the stories of my ancestors. But apparently, all of the history I have found doesn't count anymore because the term "genealogy" is now going the way of secretary and waiter and I am a genealogist. But there is a much larger issue here. Genealogy has never been accepted as a valid part of the discipline of history. After all, history is important and genealogy is merely names and dates. Excuse me, but I thought all history was merely genealogy. I always thought those people who were only interested in the elite; presidents, rulers, kings etc. were the ones missing the boat. I thought learning about my family was important not just because they participated in some event considered important or were rich, famous or called themselves nobility. I had the same thing happen to me when I was finishing my Masters Degree in Linguistics. One of the things I had focused on was the issue of "language universals" or those parts of language that are common to all humans. In other words, what makes language human? I wrote several papers pointing out the similarities between different language structures in unrelated languages. One day, one of my professors sat down with me and explained that at that time, referring to language universals was "politically incorrect," that wasn't the term he used, but that is what he meant. He told me that if I persisted in my interest in "language universals" I would never be able to get a job in the field of linguistics. In the end, that discussion was a major factor in why I ended up being a lawyer rather than a university professor. On that day, the world lost a linguist and gained another trial lawyer. In some cases, perception is more important than reality. So should I just fold up my interest in genealogy and put it away in a drawer somewhere and quietly go about becoming a "family historian?" Maybe I should take up the politically acceptable pursuit of golf or shuffleboard? After all, aren't I entitled to an "active retirement?" Does that mean I have to change all my business cards and my email address? What I see as the danger here is not merely a change in terminology. There is something more important going on. It is the denigration of the basic function of genealogy; the verification of names, dates and locations, that is at issue. There is a not-too-subtle implication that you can do family history without worrying about such mundane things as names, dates and places. So let's abandon the term "genealogy" so people will be more willing to relate to and discover their ancestors. Let me clarify, so there is no misunderstanding. I do not mind the term "family history" at all. What I do mind is the implication that somehow genealogists are not part of the "family history" community and that family history can be accomplished without resort to all that "genealogy stuff." There is a further implication that family history somehow magically appears; that stories and photos will continue to be available without the activity of doing all that stuffy, undesirable, old-people associated research. Rather than celebrating all the older participants in genealogy, it is as if the whole idea of "genealogy" is invalidated because its adherents are mostly older. After all, young people have all those computer skills that automatically qualifies them to do complex historical research. No, I am not "down on the youth." Neither do I feel that I am insulting their intelligence when I point out that genealogy requires certain skills that are generally lacking in the younger population as a whole. But I do think it is time that genealogists push back some and help those who are not so inclined to accept the fact that historical research, no matter what you call it, is a complicated and challenging pursuit. There are those who do it well and those who do not. There are those whose only interest is names and dates, but they are the exception rather than the rule. Don't throw the baby out with the bath water. Don't make genealogy a bad and politically unacceptable term in your zeal to promote family history. You might just lose the very thing you are seeking. What is the activity you are trying promote by abandoning the term "genealogy?" With the abundance of photo editing software and the ability to put photos online attached to a person with any number of online photos, we are inheriting another fine mess. You don't have to go far to see photographs that have been significantly altered from the original, assuming the original still exists in some format or another. This may not seem to be a real issue, but if you have any interest in the original photo and its provenance, you cannot help but be appalled at the way things are going. 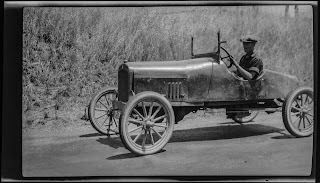 Since I have the originals of many old photos, I am acutely aware of the problem editing is causing. We can only guess at how many iterations of the photo will continue to appear. Here are four different copies of another photograph. Which is the original, if you care? Is this simply a matter of esthetics? Does anyone really care if the original is changed so dramatically? It appears that none of these is the complete original, as a matter of fact. Why do we think we can change a photograph to suit our whim and not change the facts about their lives? Oh, well maybe changing the facts isn't a bad idea either? I think it is unethical to change the original photo without providing an unaltered copy of the original, if it is available. I received an email today from my friend, Janell Vasquez, about her new news aggregator program targeted at the Online Record Collection News called GenVines.com. More about the program a little later in this post, but first I need to explain news aggregators. News aggregators or readers, as they are commonly called, have been in the news lately with the move by Google to discontinue it Reader program. This move has already opened up new possibilities for other programs to step up and take over the job of aggregating the news. Additionally, there is a need for specialized aggregators to provide content to those with specialized needs. Technically, a news aggregator can do its job without becoming a reader program. Although the two are almost identical in their function, a reader is designed to allow the user the option of selecting the sources or feeds they wish to aggregate. Simply, a news aggregator is an online program that searches the web for specific content and provides the user with a stream of updated headlines about a certain topic or from a particular source, that can can be expanded into connections with the original content. The reason behind this type of program is obvious, it can be extremely time consuming to individually review websites for updated content. Let's say you want to read a particular blog or want to keep informed about a particular topic. Searching the web or clicking on links to all the sites you want to follow could become impossible. But by using a news aggregator or reader program, that type of activity not only become possible, it keeps all of that news from becoming overwhelming. This whole process is enabled by a feed reader. The most commonly used program is referred to as an RSS Feed. RSS is an acronym with several different interpretations, usually it is said to signify "Really Simple Syndication." Syndication is an old news term that implies the aggregation of news stories into one consolidated outlet. There are a host of news aggregation programs and there was flurry of activity in rearranging the use of these programs due to Google's announcement of the demise of Reader. The process of connecting to the RSS feed is called subscribing to the feed. Once you subscribe in the reader, any additions or changes show up in your stream or list of changes. When Google made its announcement, I had already moved to another program. I presently use the most popular feed reader alternative, Feedly.com. I presently follow over 200 separate blogs and websites using Feedly. But if you are a news hog like me, you never seem to get enough. I am always missing something. This is where a program such as GenVines.com comes in. I can subscribe to GenVines.com and add that to my reader and then I get the benefit of all of the syndication from GenVines.com's sources. Voila! More concentrated news on a specific subject I am totally interested in learning about, that is, new genealogical collections. Fortunately, unlike some websites and blogs, GenVines.com makes the process of adding their site to your RSS feed obvious and simple. Many websites also give you the option of adding notifications to your email stream. Unfortunately, this is the case with sites such as Facebook.com, Google+ and Pinterest.com. With just those two sites, my email traffic has gone out of sight. I am getting dozens of emails a day. I will have to look into an alternative to getting so much email or start cutting off contact from those websites. I immediately found useful news from GenVines.com that I had missed in all my feeds. This will undoubtedly become a useful way to watch the huge amount of data going online every day. Take a look at GenVines.com. What is the future of genealogy conferences? There is an apparent proliferation of genealogy conferences. For example, if you live on the Wasatch Front in Utah (Salt Lake City, Provo, Bountiful etc.) you could attend a genealogy "conference" almost any weekend. About.com Genealogy lists a total of 20 of the "largest and best-known conferences" for 2013. The Geni blog lists Genealogy Conferences 2013 and has 21 listed through September. Another Geni.com list includes international conferences and lists 32 conferences. In going through the lists on the Web, I know about another six or so conferences that didn't make anyone's list. I am personally scheduled, presently, for 11 upcoming conferences, seminars, genealogy fairs, and other events. Some of the larger conferences seem to be getting even larger. RootsTech 2013 was reported to have over 6,700 people in attendance. Now, this is not large as conferences go, but it is large for genealogy conferences in the United States. Next year, RootsTech 2014 may be broadcast to hundreds of additional locations throughout the world. At the same time, there is an increase in webinars and webcasts available online, not to mention YouTube.com videos. The question is whether or not the additional exposure of the larger conferences, such as RootsTech, will erode the interest in local conferences or will the local conferences merely incorporate content and presentations from the larger conferences? Last year, I presented at a webinar sponsored by the Mesa FamilySearch Library. There were over 200 people in attendance for the live presentation. By this year, when I gave a similar presentation, the number of live attendees had dropped to six but the online attendance was about the same and just as many, or more have seen the presentation online. It seems that during the past year, the number of people figuring out that they could stay home and see the same presentation, has increased dramatically. Will online webcasts and webinars erode conference attendance? I think the answer to that question lies in whether or not the conference attendees feel that the social atmosphere and the verdor areas are worth the time and expense of attendance. This issue is part of a greater issue of the growth of online courses in higher education. There are articles with the title, "College Professors Fearful of Online Education Growth." Perhaps there should also be headlines about how local conferences are being replaced by mega-conferences with distributed content? My opinions about education come from, not only from my many years spent in school, but also from my years of teaching at high school and college level. But as a rule, conference attendees are far above the average public school student. It is a real pleasure teaching interested adults and not having to worry about discipline issues, like the time one of my "students" in high school, crawled up the row between the desks, where I couldn't see him and lit another student's pants on fire with a lighter. But will there be a motivation on the part of these high class attendees, when they figure out they can get the same instruction, for free, on their own computers sitting in their own home? When that time comes, I suggest that those holding conferences will have to figure out and communicate other reasons to ensure attendance at their events. 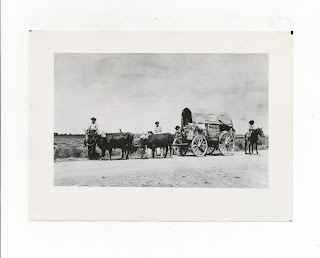 Why do we blog about genealogy? I got asked the question in the title to this blog yesterday. The person asking the question was sincere. She was wondering if she should start a blog. Her intent was to try and identify some mystery photos. I spent some time and helped her get a new blog open and ready to publish and it will be interesting to see what she reports back to me about her experience. I also started talking about having a blogging presentation and workshop at the Mesa FamilySearch Library. I guess one of the real questions is who are we talking to as bloggers? Each other? Do we really attract new genealogists? Or do we just plow the same ground over and over? My reality check is working with patrons and volunteers (missionaries) at the Mesa FamilySearch Library. As far as I can tell, with over 150 regular volunteers at the Library, I can think of about a half a dozen of them that have ever mentioned my blog or anything about reading blogs. These are people that do genealogy every day, week after week. In classes for the missionaries, I still have people regularly say that they have no idea what a blog is or does. If this is the case, then why do we blog? From my standpoint, I would probably blog even if I didn't have an audience. It is comforting to find out someone reads the stuff I write, but I would write or teach regardless of the numbers. I had someone show up early to a class yesterday; one person. She asked if the class would be cancelled if she was the only one there. I have never cancelled a class because there were "too few" attendees. My ultimate goal is changing the world one person at a time. So I think it is a privilege to teach and the numbers are not a criteria for how or what I teach. 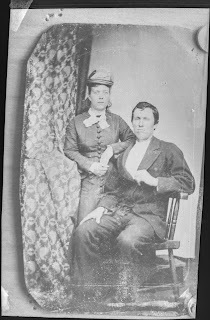 On the other hand, because we have genealogical content to our blogs, we have had huge successes in contacting relatives and obtaining vast quantities of original records and photographs. In short, the genealogy blogs have proved to be immeasurably valuable to the expansion of our genealogical information and collaboration with relatives. The benefits are enormous. For that reason alone, I would have a genealogical blog. That is also the reason why I started writing for my daughter's blog, TheAncestorFiles.blogspot.com, to increase the genealogical content of my writing. I could go on with reasons why I blog, but most of them are very personal. I also enjoy meeting and corresponding in some fashion, with other bloggers. It has been an amazing experience and absent being sent off to the care center, I will probably keep writing. Constantly as usual. On May 4, the University of Alberta Libraries created the 2,000,000,000th holding record in WorldCat, marking a major milestone for this unique library resource. WorldCat.org is part of the OCLC or Online Computer Library Center, a nonprofit, membership, computer library service and research organization dedicated to the public purposes of furthering access to the world’s information and reducing information costs. See Wikipedia: OCLC. OK, now if I had to list the top five websites I use the most frequently, WorldCat.org would always be on the list. There is nothing else close. Over 74,000 libraries in 170 countries have used OCLC services to locate, acquire, catalog, lend, preserve and manage library materials. If you haven't used WorldCat.org, you haven't done your homework for any type of research. Click on the link and start looking in WorldCat.org. In honor of Memorial Day next week, MyHeritage is granting free access to millions of military records from our most popular collections. The records can be accessed from here. The free offer ends on May 28. The collections will help you journey back in time to some of the most important conflicts in world history, which impacted American families as well as millions of families worldwide. 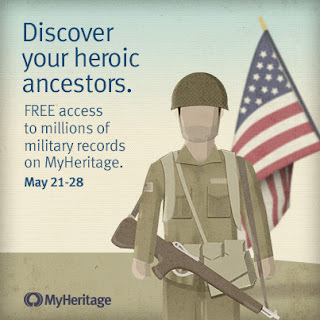 Here is the link to our official blog post here - http://blog.myheritage.com/2013/05/memorial-day-free-access-to-us-military-records/ and an image is attached. I have been trying to analyze my impressions that the basic activities of genealogy, that is doing research into family origins, is being popularly denigrated by characterizing what I do as merely an interest in names, dates and places when nothing could be further from the truth. This trend is encapsulated in the attitude that "family history" is more than mere genealogy and that there is a dichotomy between what genealogists do and what a real "family historian" is interested in. This current attitude is evident in popular TV shows and other media where the "genealogists" are pushed into the background as if they have no real part in the interesting and stimulating parts of "family history." So where did the stories and photographs come from? In my own experience, for the past thirty years or so, I have been accumulating thousands of photographs and documents that would have been thrown out as trash long ago. Boxes and boxes sitting in basements and garages that were on their way to the dump because no one was interested enough to look at them. I heard another story, just yesterday, of a "genealogist" who could find no one in her family who was interested in her work and it went into the trash. Fortunately, we were able to find a manuscript copy of her work that had been preserved in a library and digitized online. But throwing away history is not uncommon. 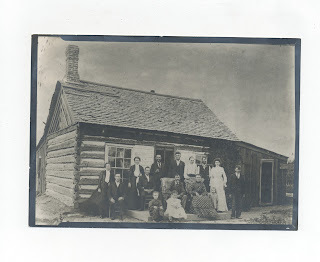 Do we broaden the appeal of "family history" by ignoring or even downplaying the role of the preservationists among us? Again, where do the stories and photographs come from? 3. Handwritten diary probably by Margaret J. Overson from 1905. 7. Handwritten original of Journey to St. George. None of these documents have been previously published or available to family members. Without the efforts of the "keepers" also known as genealogists, where would these documents be today? What chance would they have of being preserved? I can tell you that this is only the barest beginning of the documents that would have been lost to the trash without the interest of a genealogist. So, I am dumbfounded that somehow family history becomes interesting because of the photos and stories to the very people who would have thrown those and other documents away because they were of no interest. Mind you, I am not at all in any way, shape or form against gaining the interest of a wider audience for genealogy. What I am concerned about is throwing the baby out with the bath water. Instituting "new" programs that ignore the actual way these stories and photos were and are preserved; by a cadre of dedicated genealogists who have worked, despite apathy and actual opposition, to preserve our collective family history. Yes, family history is more than names, dates and places, but the genealogists have known that all along. Those very same people in my own family that spent their lives gathering family history, were some of the most unpopular people in that same family. Is there something deeper here that needs to be addressed, rather than just a repackaging of the merchandise? Meanwhile, I will keep teaching, helping, fixing computers, collecting, scanning, writing and doing my own genealogy until I get carried off to the Care Center. Nathan Murphy, a consultant at the Family History Library, mentioned a new book about the history of genealogy. The book is Weil, François. Family Trees: A History of Genealogy in America. 2013. I must say that the book would only be of interest to those with a fairly good understanding of history and some experience in genealogy. But the book does address many of the same issues I have been thinking about and raising in my blog posts over the past few years. One great advantage that is coming from reading the book is that I am beginning to understand more of the details of how genealogy developed in America rather than having a vague idea. I am guessing that you would appreciate and enjoy reading the book, if you spend time thinking about genealogy as a subject, and not just thinking about how to do genealogy. Another reason the book is interesting to me, is the fact that much of the research I have done with my own ancestors dates back to the early settlement of America. 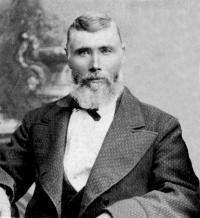 My Danish and English ancestors all arrived from England, Australia and Denmark back in the 1800s. 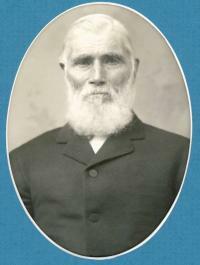 My nearest ancestor who was born outside of the United States is my Great-grandfather Marinus Christensen who was born in Torslev, Hjorring, Denmark in 1863. 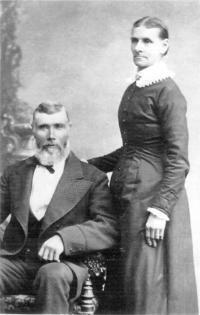 My Great-great-grandparents came from Denmark, England by way of Australia, England, Wales and Northern Ireland. But my Tanner line goes back to the 1680s in Rhode Island and some of those ancestors arrived on the Mayflower in 1620. For me, the defining factor in all of my genealogical pursuits has been the fact that of my 16 Great-great-grandparents, all of them except two, were early pioneer settlers in Utah, California and Arizona. This fact has given me a real, present-day connection to all of my ancestral lines because I grew up in the same areas where they had settled in the 1800s. In each of my family lines there were those who did extensive genealogy. In three of the four sets of Great-grandparents, there are published surname books and in the Tanner line, there are several such books, some beginning with my Great-great-great-grandparents. The scholarly level of those surname books varies and none of them have adequate source citations. 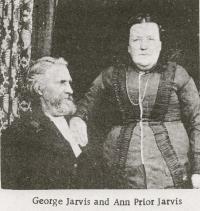 I have mentioned before in these posts, that my interest in genealogy arises primarily because of the omissions and inconsistencies of those surname books and the less-than-accurate oral traditions transmitted to me by my family. For those reasons and others, I am acutely aware of the need for documentation. Farmer, John. 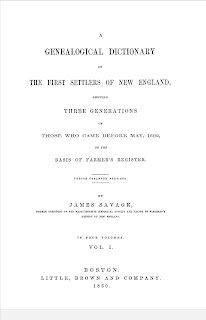 A Genealogical Register of the First Settlers of New England ... To Which Are Added Various Genealogical and Biographical Notes, Collected from Ancient Records, Manuscripts, and Printed Works. Lancaster, Mass: Carter, Andrews & Co, 1829. Savage, James, and John Farmer. 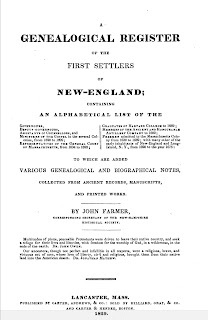 A Genealogical Dictionary of the First Settlers of New England Showing Three Generations of Those Who Came Before May, 1692, on the Basis of Farmer's Register. Boston: Little, Brown, 1860. I relate to these early genealogical efforts because the circumstances and the background of those antiquarian genealogists is so similar to my own and they had some of the same concerns about documentation and source citations. It is interesting to me that after almost two hundred years of genealogical history in America, we are talking about some of the same issues that were raised by these early genealogists. Burned Courthouse - Obstacle or Excuse? From time to time, in talking about missing ancestors, I hear the comment that "of course, I can't find any records because the courthouse burned down." For the most part, I view this as an excuse to give up, not a real obstacle to finding an ancestor. But the question is a real one: what is the impact of the loss of the courthouse records in any given county? Is my perception that this "problem" is highly overrated, an accurate impression? Let's get some basic sources for help first, before I go into a deeper analysis. I suggest starting with the FamilySearch Research Wiki article, "Burned Counties Research." You may also want to have a look at the Research Wiki article, "United States, How to Find Genealogy Records." Where there has been a fire or other disaster, whether in a city or a county, is also referred to as a "lost record locality." The first consideration to compensate for the lost records is to determine the exact time frame involved in the loss. Next, determine, if possible the exact type of records lost and whether any partial records were preserved. Then determine what surviving records can be used to determine the content of the destroyed records. Land records, even if destroyed, need to be reconstituted because people still have to buy and sell real property. Look for records in private record repositories such as title insurance companies and abstractors offices. My example is Appomattox County, Virginia. This county was created in 1845 and the record is that "all records in the courthouse were destroyed by fire on 1 February 1892." See Library of Virginia, Research Notes Number 30, Lost Records Localities: Counties and Cities with Missing Records. So what other records are available for that time period and which records have been reconstituted? You will probably note that the time period includes the years of the U.S. Civil War. The battles of Appomattox Station and Appomattox Court House, A Author: Calkins, Chris M.
Author: Andersen, William F., Jr.
Now, of course, this is only one repository, but it should be noted that many of the records listed above cover the time period when the courthouse records were "lost." I might also go look for newspapers from and around Appomattox county. This is only the barest beginning of the search. The point: You have plenty of places to look beside moaning about a burnt courthouse. This is another in the series of mystery photos from the Overson Photographic Collection. After processing over 5,5000 photos, I have determined that Margaret Godfrey Jarvis Overson was the primary photographer, but that photos were also taken by her father, Charles Godfrey DeFriez Jarvis and likely by her daughter, Eva Margaret Overson Tanner. There were also a number of contributed photos and as shown here, copies of earlier photographs from a variety of photographers. These photos were taken primarily in and around St. Johns, Apache, Arizona. But some came from Utah and a few from California and other states and even other countries. 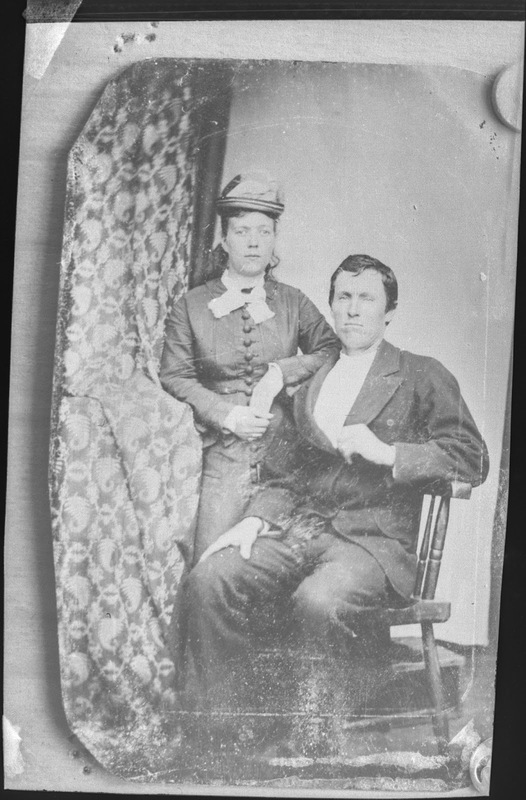 The earliest photos appear to have been taken in the 1840s or 1850s. Some were taken from that time to about 1900, with the majority being taken from around 1900 to 1920. 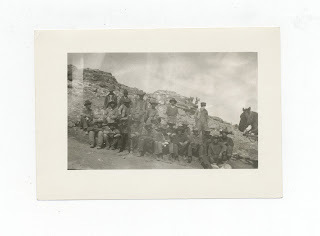 Some of the photos date into the 1940s with one or two taken just before Margaret Overson died. There are family photos that date into the 1950s but these are not included in this collection. He goes on to explain that on the "easy" side of the chasm we use modern records with abundant details and that on the other side, the records are "incomplete, spotty, illegible, unindexed, hard-to-locate, or offline." Since reading that post, I have been thinking about this issue extensively. I have had several discussion, some at length about different aspects of the problem and come to some conclusions. One of the recurring suggested solutions to the problem is involving those approaching the chasm or even those who potentially may come to the chasm, in the FamilySearch Indexing program. By participating in the Indexing Program, people who have limited experience with difficult records, learn valuable tools that assist them in moving from the "easy" records to those that are more difficult. The FamilySearch Indexing program currently has over 156,000 volunteers. By participating in the Indexing Program, the volunteers become acquainted with a variety of records and learn the connection between searching records and finding the names of ancestors. This link is the key to bridging the chasm. It would be very interesting to know how many of the people who do Indexing go on to doing research in their own families. I would guess that given the opportunity and incentive, they would be the prime candidates for moving in that direction. I have had several conversations about involving the youth in the Indexing program. Where that program is operating among the youth, the transition to doing genealogical research is facilitated. The burden for initiating such a program lies with the youth's parents and leaders. Where there is little interest among the parents and leaders, there is no youth activity. If you want to bridge the chasm, get the youth involved in Indexing. In my own area, my LDS Stake, the main obstacle to implementing an active Indexing program among the youth is not the youth, it is the leaders. What Happened to FamilySearch TechTips? Does your family have a Coat of Arms?